Displaced in cities: Who are the hosts? The recent ICRC report, Displaced in Cities, shines a much-needed light on experiences of hosting IDPs in urban centres. This is an increasing area of focus for humanitarian action, but understanding of this phenomenon is sorely lacking. While humanitarian agencies are increasingly considering hosting at the national, regional and city scale, there remains a significant gap in understanding and working with host families—those individuals who share their accommodation and resources with displaced people. Hosting practices are more diverse than currently portrayed, forging relationships between unrelated individuals and offering protection, belonging and identity, as well as meeting basic needs. To provide better humanitarian support we need to question underlying assumptions about host families and to identify ways to better engage with this vital support system. Taking the Displaced in Cities report as my starting point, I offer my own reflections on hosting practices for displaced populations. In doing so, I draw on my PhD research around refugee hosting practices in the protracted urban context of Amman, Jordan and experience working with hosts and IDPs in DRC. ICRC’s report is a valuable contribution, drawing attention to the little understood issue of IDPs in urban areas. In putting people’s own experiences and understandings at the forefront of the report and questioning existing humanitarian approaches and assumptions, it makes a call for humanitarian actors to reconceptualise their work with displaced populations in urban environments. The recognition of the importance of host families within the report is a welcome inclusion. Though humanitarian agencies are demonstrably aware of the importance of these support networks, I’ve found there is little detailed information available on host families. Where reports and studies mention host families, this is often merely one line, or at best a paragraph. With so little in-depth information available, it’s difficult to put figures on the number of people living in such arrangements. The available evidence suggests hosting practices are widespread and large-scale. In Jordan, CARE found that 23% of Syrian refugee households were sharing accommodation with non-family members in 2017. I believe rates to be higher among other refugee populations in Amman, who have less access to assistance and do not have access to camps. In DRC, OCHA estimates that 96% of the 16,000 people internally displaced in December 2017 were living with host families. In the opening pages of the Displaced in Cities report, the authors rightly note that there has, as yet, been little focus on the experiences of IDPs in urban environments. They also point out that IDPs in different cities will face their own political, economic, social and legal constraints, in ways that differentiate their experiences from those of refugees and non-displaced city residents. To me, this gap in the analysis also applies to hosting arrangements for both refugee and IDP populations living in cities. One of the key recommendations outlined in the report is the need for responses to be built upon reliable data and analysis, rather than generalisations and assumptions. In my experience, despite frequent references to host communities and host families there is little insight into who hosts are, what the experience of hosting and being hosted is like, and how humanitarian agencies influence these relationships. Are people better off being hosted? I find that it is often assumed that displaced populations living in cities are better off than those in camps. In addition to increased economic opportunity and freedom of movement, the possibility of living with a host family is often cited as an explanation of why cities can be a better option. While hosting can present many benefits and is largely seen as a positive coping mechanism, it is also often the only option for those who do not have access to camps. With high rental costs, many urban refugees and IDPs have little choice but to live with others. Hosting can provide shelter, access to food, water and sanitation facilities, connections to work, safety and protection, and psychosocial support and advice. My research suggests it can also contribute to a sense of belonging, by maintaining or restoring someone’s identity and sense of connection to their culture, history and place of origin, and to beginning a process of integration in their place of displacement. Hosting can also present a danger—overcrowding, poor living conditions, ill-health, stress and a lack of privacy, exploitation and abuse. With so much at stake, I think it’s essential that humanitarian actors better understand how hosting works and the impact their policies can have. The hosting relationship is often seen in terms of securing access to resources to meet basic needs and described as a burden on hosts or exploitative of guests. It is also assumed to take place between family/kin, and between citizen-hosts and displaced-guests. To me, this misunderstands the basis of many hosting relationships and the decision-making processes and expectations involved. Thus, it misunderstands which factors may influence the experience of being hosted and the ‘terms of agreement’. It avoids engaging in the complex societal and personal relations and norms around hosting. Furthermore, it fails to recognise the huge role hosting relationships play in the lives of displaced persons and hosts, beyond the provision of shelter and basic assistance. While in many cases displaced people are hosted by family, or draw on pre-existing relations to find a host, this is by no means universal. In Jordan, I found that hosting arrangements between non-family members is common, especially in non-Syrian and non-Iraqi refugee populations, and particularly among young men. In many cases, single people join together to share accommodation, or un-related families form a new household. Importantly, these relationships aren’t just about sharing rental costs but are a vital safety net in a context of uncertain informal employment and low levels of humanitarian assistance. Unlike the increasingly-popular refugee hosting programmes in Europe, in many places in the global South host families are not organised by an NGO or another organisation. Rather, they are formed by the people involved, sometimes with the support of their church or mosque, a community leader, or a community group. 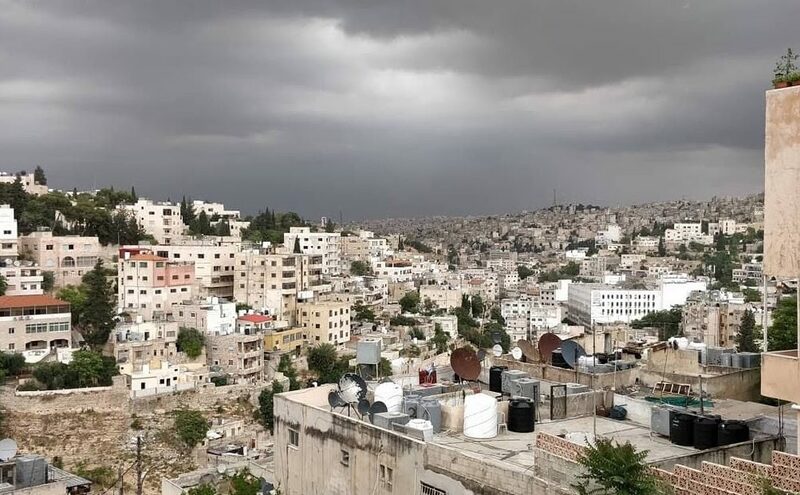 In all of the hosting arrangements that I encountered in Amman, refugees were not being hosted by Jordanians, but rather by other refugees, normally of the same nationality. While Syrian and Iraqi refugees were often hosted by family relations, normally those who had arrived in Jordan a few years or months earlier, Sudanese and Somali refugees rarely had these options, and usually arrived in Jordan without knowing anyone. Instead, they created hosting relations based on ideas of sharing and solidarity (for a brief discussion of the motivations to host, please visit the CENDEP blog). What is the role of humanitarian actors? Humanitarian actors have a great influence over hosting arrangements. Most obviously, in situations where humanitarian agencies have the capacity to distribute cash grants and offer rental support, this assistance plays a major role in influencing people’s housing decisions and their experience of hosting. For example, Waseem, a young man with a serious injury that prevented him from working was at risk of having to leave his hosting arrangement because he could not contribute to the rent costs. Recognising this, Waseem did all the cooking and cleaning at home as his contribution towards the household. Though most of the nine men he shared with were happy with this arrangement, several of them weren’t, creating tensions and arguments at home. Waseem told us that once he started receiving monthly cash assistance, the situation at home stabilised and he no longer felt under threat. Some NGOs have run pilot projects working with landlords to offer secure space to refugees in return for home improvements. Interventions aimed at improving tenure security are welcome, with the recognition that many hosting arrangements are informal and that for many their flexibility is desirable, though risky. As recommended in the Displaced in Cities report, we need further and better analysis of the situations of host families in order to capture the impact of displacement on them and to understand how they support displaced persons. Doing so would provide us with greater insight into how humanitarian action already influences such practices and what we as humanitarian actors can do better. This would allow us to support positive aspects of hosting while minimising the risks and protection concerns of everyone involved in the hosting relationship. By placing people at the centre of response and focusing on dignity and resilience, we can enhance and promote existing support mechanisms—such as hosting—and prioritise the choices and preferences of people affected by displacement. In this regard, the 2016 localisation agenda emerging from the World Humanitarian Summit is a positive development. Beyond just looking at increasing and improving equal partnership with local organisations, we need to maintain this energy to look at what people are doing for themselves. In particular, we need to look at the ways that refugees are helping other refugees, acknowledging that the main source of assistance is frequently not citizens of the host country nor governments or humanitarian actors, but rather other migrants, displaced populations and refugees. Humanitarian actors are still learning how to work in urban environments. In doing so, we need to make sure that we’re taking a step back and looking at the whole urban environment, rather than working in sectoral silos or focusing on humanitarian action to the detriment of medium and long-term development. As part of that, we need to pay more attention to which spaces and services are accessible to refugees. We should see how refugees are creating, using, and perhaps changing them in ways we have not considered. This includes looking beyond the places we’re used to working in—NGO offices, community centres, and schools—and focusing also on workplaces, public places, and homes (with appropriate privacy and safeguarding protections).